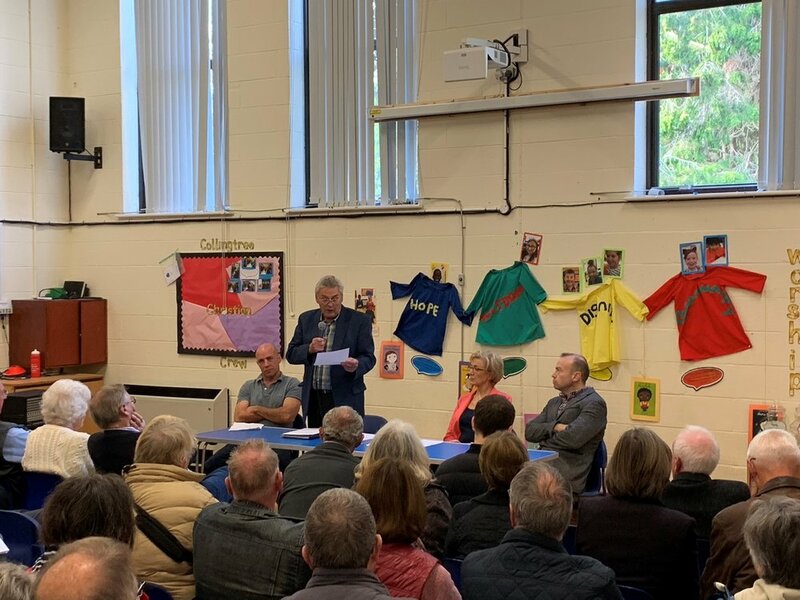 Earlier today I met with around 150 residents from Collingtree, Roade, Blisworth and the surrounding communities who are concerned about the two strategic rail freight interchanges that are being proposed in our area. Alongside my colleague Chris Heaton-Harris, the MP for Daventry, and the representatives of the local action groups, Mark Redding of Stop Rail Central and Rod Sellers of Stop Northampton Gateway, I provided an update on where the two proposals are in the planning process, the next steps for each, and how concerned residents can engage through the Planning Inspectorate. We then took questions from the audience on a wide range of issues including environmental impacts, traffic mitigations and road improvements, capacity on the West Coast Main Line, and how the two sites fit within the wider national policy for rail freight. I am supportive of the need to push for a modal shift in freight transportation from road to rail. It is vital, however, that the Planning Inspectorate makes a fair determination through the examination processes on whether either, or both, of the proposals can deliver on their stated aims, and whether they are suitable for our area. I know that the vast majority of local residents have significant concerns about both developments, and I will do everything I can to ensure those concerns are represented to PINS. Yesterday, PINS decided not to accept Ashfield Land’s Rail Central proposal for formal examination, citing concerns arising from a number of inconsistencies in, and missing information from, their submitted draft Development Consent Order application. Ashfield Land has indicated that they will be considering the points raised by PINS and resubmitting as soon as they are in a position to do so. Roxhill’s Northampton Gateway proposal is now in PINS’ examination process, with the first deadline for formal responses by registered interested parties coming at midday on Tuesday 6th November. I would encourage everyone who has registered to send PINS their concerns as soon as possible and, as ever, I would be happy to answer any specific concerns or queries my constituents may have. I would also like to thank Rebecca Osborne, Executive Head Teacher at Collingtree CE Primary School, for kindly allowing us to host the meeting in the school hall.